Welcome to our homestead. Although you visit our homestead virtually, we want you to feel welcomed and a part of the family. We treasure our visitors and enjoy being led to share our knowledge, inspiration and offer you encouragement on your daily walk. We enjoy getting to know you and for many of you, your willingness to share too! So when you visit, no matter if you are listening to a podcast, reading a post or watching a video – our prayer is that your visit here will be memorable, peaceful and that you will walk away with knowledge and encouragement. 2018 became a year we began Living With Intention and in doing so we put our focus on what was the MOST important to us. Faith & Trust – Our home is lead by God and our focus is heavily on him for everything we do. We choose to walk in faith and be disciples for him. We are not perfect, but we strive to be the best that we can be. We have found spending time in the Word daily and building on our Faith and Trust muscles create a stress-free and worry-free life! I enjoy using Jesus Calling as a go-to devotional and I would be lost without my Inspire Journalling Bible. Head Of The House – The Mountain Man is the head of our house. He is our prayerful rock. I do submit to him as I am called to do, but as his helpmeet and willingly as his equal. We walk side by side and work together. This is a subject that causes heated discussions at times because of how it is taught, perceived and unfortunately because of misuse. I, as the woman, am supposed to submit to him (which means in many ways not just in the one that is usually the first to come to mind) and that does not mean abused or that somehow I am a lesser person. He as the head of the household is also supposed to treat me like the church. When these dynamics are put together properly and as they are supposed to be, an amazing relationship is formed and is able to grow! We need to nurture our men into good healthy leaders that walk with confidence, strength and a willingness to protect! Our men are meant to be the leaders of our homes and our protectors. We also, as a team (husband and wife), need to focus on the health of our marriages being supportive of one another and spending quality time with each other. Communication is key! Keeping those homestead fires burning is important! Family – Our strong family bond is important to us. We have experienced and walked through a lot of adversity and trials, but through those experiences, our bond has gotten so strong that together we are unstoppable and unbreakable! It is important to build each other up and to help our youth to be strong, independent, faith-led individuals that know how to manage money, and have the skillsets to take care of themselves. Our son is high functioning autistic with Asperger tendencies and he is no exception – our lifestyle has afforded him some great opportunities and we have taught him that the Sky Is The Limit. Austin has overcome 98% of his autism and Asperger tendencies as a result of God’s grace, our persistence and devotion to seeking answers, natural remedies, and our lifestyle. Living Debt Free – As many of you know, the last three years have been extremely hard for us financially as a result of my life-saving surgery in 2016 and the healing protocol that I have been on since. We have been fighting against filing bankruptcy all year and are prayerful that we will get out of this mess and be debt-free within the year without having to file. Having goals and plans regarding your future and finances is important and so is doing your due diligence in keeping a working budget and being 100% devoted to not giving up. We use EveryDollar and YNAB as our budgeting solutions and also LOVE following and learning from Dave Ramsey. Prior to my surgery, we were heavily focusing on a debt-free life, but life through us some lemons and we now need to make some lemonade – in other words, we are NOT giving up, we are making the best of our situation and trusting God for an amazing outcome! One of the reasons I feel that a lot of people fail at budgeting is because they have Tithing and Saving on their budget, BUT those two things, out of fear, continue to get pushed to the bottom of the budget. Without tithing we are not honoring God the way we are supposed to – he should ALWAYS be paid FIRST and TRUST ME, he will provide!! Without saving, we don’t have anything to fall back on in emergencies and emergencies WILL happen. So how do you get past this hang up you ask? Great question – you start strengthening your FAITH and TRUST muscles and just DO IT!! Health & Our Food/Bounty – We choose to take good care of ourselves. Our body is a temple and we choose to treat it as such. We get enough sleep, drink plenty of water, exercise and are very conscious of not only what we put in our body, but also what we put on our body. 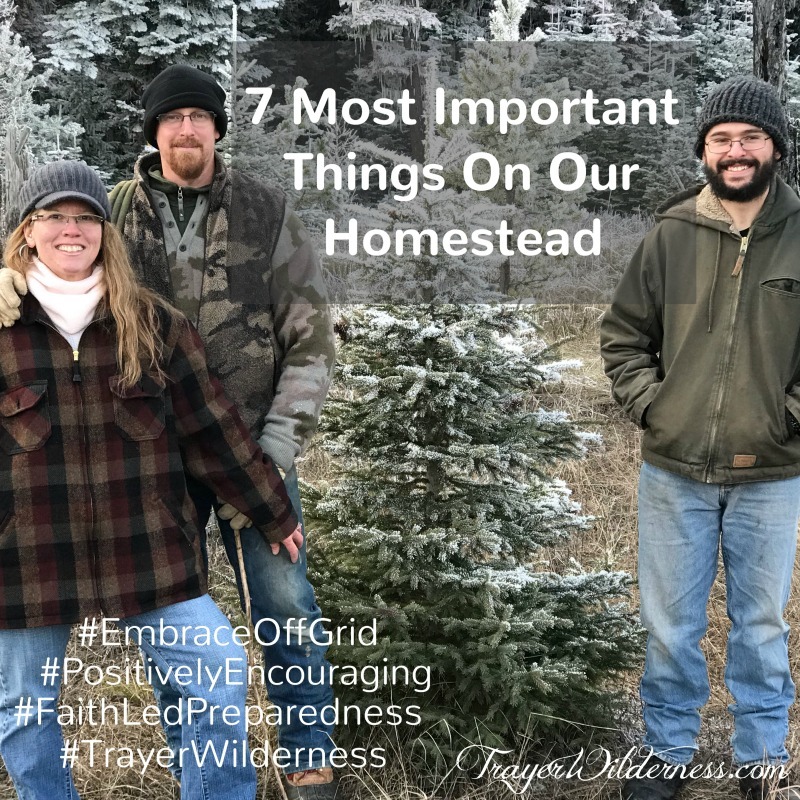 Taking care of ourselves is an important aspect of being able to accomplish the things necessary on our homestead – when we are running like a well-oiled machine we are able to accomplish a lot! We choose very carefully what we put in our bodies. Today’s food is poison and it is important for us to do our due diligence and either seek out or grow the best possible food we can put in our bodies. This goes hand in hand with our health. Many of the sicknesses, illnesses, and diseases today are a result of our poor quality food. I have learned first hand how drastically GMO’s can harm the body and result in illness as well as how sensitive our bodies become once we have removed all the garbage. We grow, forage, hunt and harvest from the wild as much as we can and we purchase all non-GMO, organic raw ingredients for our from-scratch diet. Serving Others – We are all called to serve and love others. When we take our focus off of ourselves and turn it toward others there is great growth and joy found in this! It is also a matter of the heart when you take time to help and assist others. We enjoy and feel led to be a light to others in whatever way we can! Enjoying The Journey – In society today, we could very easily be led to believe that it is meant to be all work and no play, but in order to be the best we can be – we need to take time away to enjoy life. To take this a step further, it wouldn’t even be that we need to step away to enjoy life – what really needs to happen is that we need to slow the pace and Live With Intention. Live life by our terms – not by societies terms. We don’t have to be running at the speed of light and keeping up with the Jones’s – we need to learn to focus on what is most important to us! We must make our most important things in our life non-negotiables on our schedule and we need to guard and protect them. By doing so, you are more likely to enjoy the journey because you are focusing on the things that give you the most joy. Once our attention is brought to the most important things in our lives and we start to focus on those things, life becomes much sweeter, richer, fuller, and SO rewarding! So I ask you today, what are the things that are most important to you? Wishing you a happy, healthy, and prosperous Christmastime and New Year.